The Koni Sports Car Challenge Series is one of the more exciting racing series that I have experienced. You are watching car that can be rolled onto the track from the street (performance wise) and race door to door. If you have experienced it I would not miss this FREE opportunity. You will also be able to park for free in the GRAND AM EXPERIENCE FOR MAZDA OWNERS CORRAL. Ticket info/ link to purchase ticket: Tickets are FREE as long as you download it before you get to the track. $10 for walk ups. • Starting grid fan walk - you can walk out on the track just before the race! A blurb from Eric Meyer from Meyer-motorsports. Here's the scoop on the ticket along with credible information on Homestead (and future) events. There is a car corral with 100 spots for Mazda Owners. First 100 ride shotgun. Keep in mind that this is a big space that fits approximately 100 cars. Maybe more, maybe less. You can coordinate with James P. on this to get an infield parking pass for this corral. Previously the idea was to print a .pdf on an 8.5 x 11 and stick it in your front windshield. James----are you still on this? The corral is earmarked for Mazda's however there will be OTHER corral's as well. Grand-Am is growing like a weed and other brands are interacting with G-Am to enjoy all the value that a race event like this can provide. I'll suggest to you that ours will likely be the largest one---only you guys can make that happen. Previously the Grand Stands were not going to be open to the public however this might change if turnout gets real big. 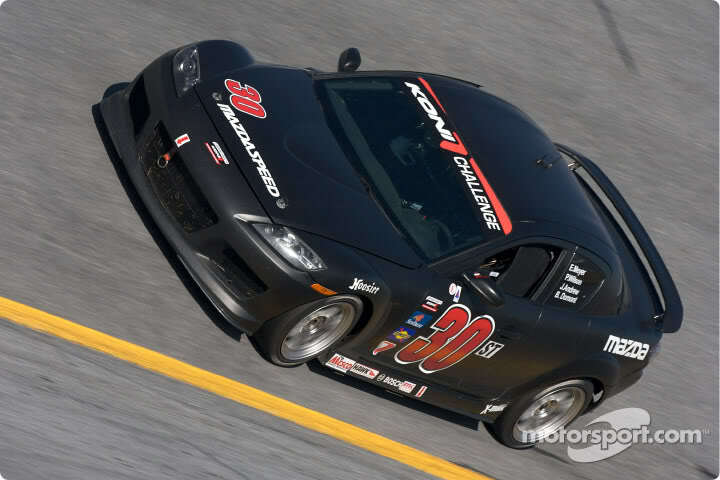 Grand-Am is the organizing entity for this however the Grand-Am Experinece For Mazda Owners is currently being coordinated locally by a few select individuals---James P. being one of them. FOR FUTURE GRAND-AM EVENTS AT THE VARIOUS TRACKS ACROSS THE U.S. WE ARE LOOKING FOR LOCAL MAZDA CAR CLUBS TO HELP HOST AND MAN THESE EVENTS----Help with registration, parking, coordination, etc. Mainly we need your help to spread the word on various i-net forums, import and race shops, etc. 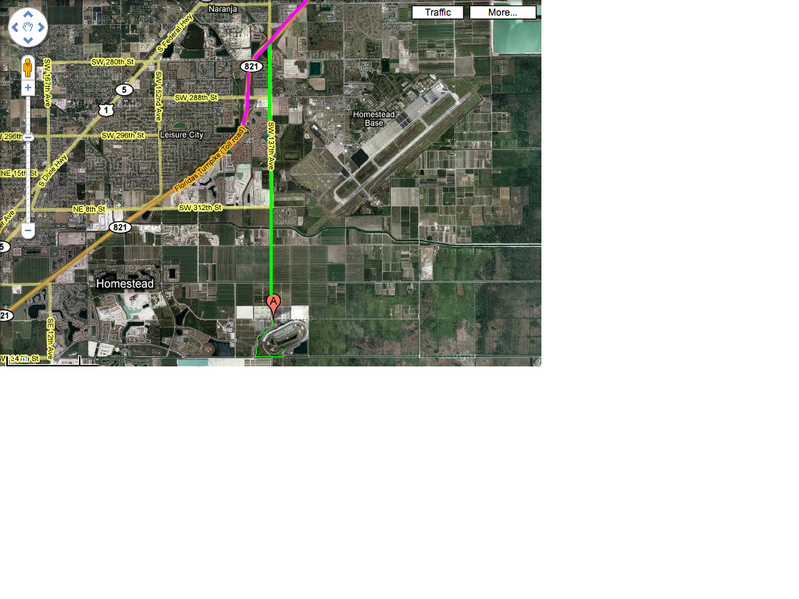 Grand-Am has given us a space to park and has given us a value packed informal schedule to attend. Its a light schedule that allows you to zip in and zip out if you choose to watch the practices, qualifying and the races more than attend a few of the coordinated gatherings. I'll suggest to you that the entire idea behind this was to host a series of small meetings over the weekend to allow new and seasoned race fans a glimpse into what G-Am is all about. Based on our first attempt at holding this at Daytona with a few dozen Mazda and race fans (a test of the Grand-Am Experience for Mazda Owners) the feedback was very well received. I can't promise anything but will share that a few Mazda VIP's got to go up into the Daytona tower and to the spotters area 300 feet above the track. ONE OF THE REASONS you'll want to acquire a GAE4MOwners pass is to identify yourself to the various Mazda teams so WE KNOW WHO YOU ARE. It makes it easier for us to identify you guys and give a zoom-zoom shout out. Thanks to those of you that who respect those times when teams are hustling to fix a car or get work done prior to the race. I'll suggest to you that approaching the drivers and team owners is generally accepted and welcomed by all teams. Keep in mind that if you blow the motor in your #30 RX8 AND transmission right before the race some driver/owners may not be able to spend time with you (ask me how I know this). I'm working on a list of people and their pictures for any of you to easily identify and approach. Our Meyer-Motorsports crew along with the Freedom Autosports guys are wide open for conversation and chit chat. Please respect the crew guys working on the car and stand far enough away so they can take care of biz. Another thing---don't be afraid to peak your heads in the car or under the hood when the car isn't being worked on. Take pictures if you like---this is all generally accepted G-Am etiquette. It's just one of the things that makes GAm special---fan access. So.......Homestead is the first OFFICIAL Grand-Am Experience for Mazda Owners event. A full season of these efforts are planned for all 2009 Koni Challenge events. It is OUR event. It is YOUR event. It is everyone's event. We can shape this and mold it into something special and I'll suggest to you that GAm will allow us some very good things that are likely to be exclusive to us Mazda owners. Naturally we will all have to be cool. Donuts, burnouts and keggers are something neither Grand-Am or Mazda corporate wants to be associated with. The Grand-Am target demographic target involves families, kids and has no room for ignorance of safety. I'm sure everyone gets this but it needs to be said. Here is how you can help so Mazda owners attending Homestead and future events can get preferred treatment---- tell a friend. Tell two friends. Bring non-Mazda race fans and pack the venue. We will be randomly picking a few pass holders (must register at the track and have your GAE4MOwners pass) for HOT PIT access. This is something you can't buy. I am currently coordinating with a few Mazda Koni ST teams to work an "adopt a fan" for the race. We will put you to work and get you front-row-joe seats and a radio headset for Saturday's race. So tell a friend. Bring the family. Bring your cameras. Plan to do a write up on this and other forums if you enjoyed yourself. Post a video. Plan ahead for dinner with friends near your hotel. Share this offer with your NASA, PBOC and other car clubs. I am currently working on a dinner plan for Saturday night so leave that open and you're likely to meet and chill with Koni Mazda teams, owners, drivers, crew, etc. This will Sat. night after the race. I know a bunch of these guys and they put their pants on just like everybody else. Tell a friend. Plan to pack the car corral and make our 1st event one to remember. It all begins at Homestead this month. Tell a friend. Tell a Mazda buddy. Represent the zoom zoom. Ok, here is some important information that I received from Eric Meyer and Steve Focazio, this afternoon. All Mazda owners who are attending the event need to follow these instructions in order to make this event as smooth as possible. 1. You must arrive by 8:30AM, not at 9:00AM. Any one arriving after 9:00 AM will not be allowed entry to the Mazda Corral, nor will you be able to particpate in the parade laps. The reason for this is quite simple, we have to move our cars through the paddock area, where you have a huge mass of people. We will be marshalled in by Grand-Am staff to the infield where there will be 3 corrals Mazda, Porsche and Mustang. 2. We will be registering you outside of the entrance to the infield, so pull off to the side, come over to the registration area, (we'll have signage up) pick up your parking pass, wrist bands and sign a waiver so you will be able to particpate in the parade laps. You will also be handed a schedule of events, these are voluntary, you do not have to attend, but we highly recommend you check them out. There will be alot going on in addition to the great racing, we'll have a few surprises for you guys as well. So we'll see you all on Saturday morning, bright and early! 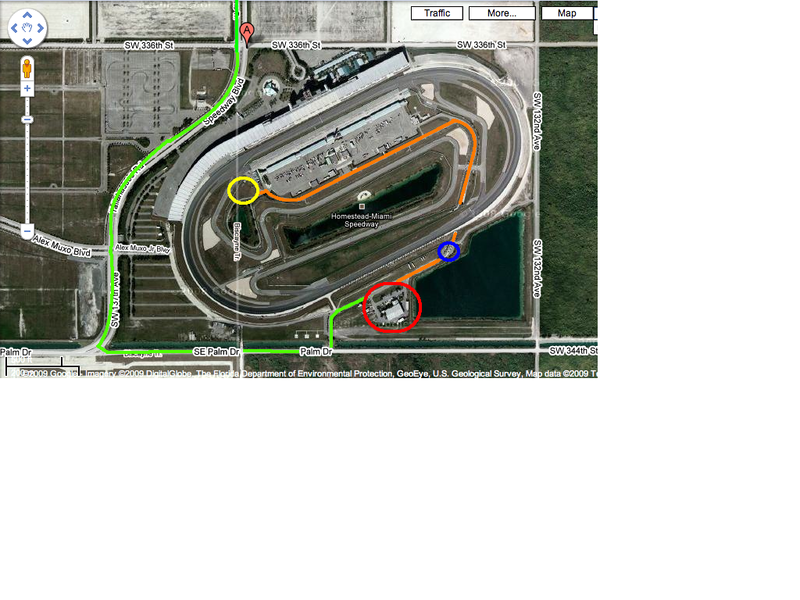 for those who have never driven inside the speedway here is a simple map of how to get there and where the car corals will be. - Make a left at the light and go all the way down. - Make a left towards the building behind the speedway. - PARK on the grass in front of the credentials office. I will be there handing out the parking passes and organizing your entrance as a group into the paddock. RED circle is the Credentials office. You will park on the grass across from thIS building to receive your parking pass. BLUE circle is the security gate, if your late and try to get in without a parking pass, they will stop you. YELLOW circle is where the car corals will be. SUNDAY if you are not there by 9am, you will not be able to park your car inside. There will not be any leeway like Saturday. Its going to be a great weekend! 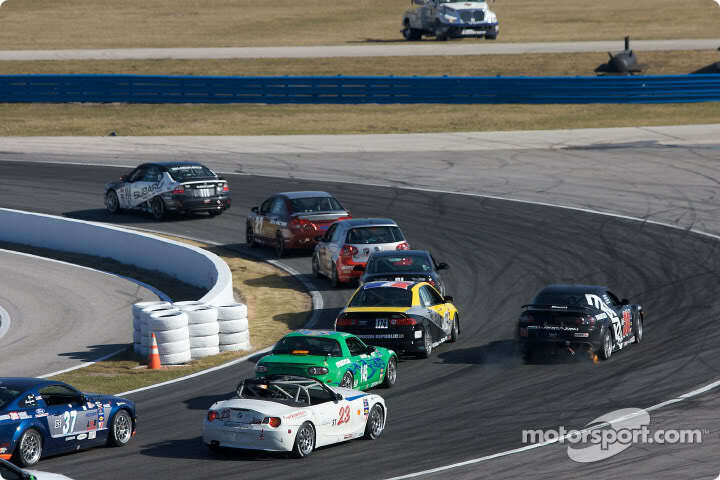 Free Mazda Corral @ Sebring Raceway Weekend March 17-20th! FYI Koni for Gen 3! Mazdasummerpalooza 2008 July 20th in Clearwater, FL!